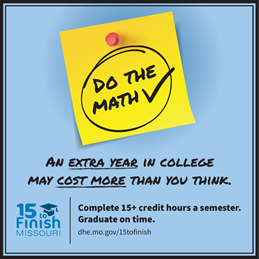 The 15 to Finish initiative encourages full-time college students to complete 15 or more credit hours a semester to put them on track to receive an associate degree in two years or a bachelor’s degree in four years. 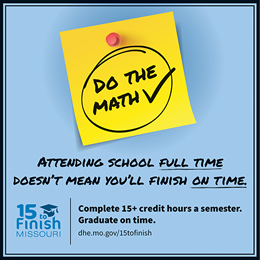 Less than half of college students in Missouri earn an average of 15 credit hours per semester, making it impossible in many cases for them to graduate on time. As a result, students often need an extra year or more in school to finish a degree. Additional time in the classroom comes at a steep price. An extra year in college can cost students more than $50,000 in tuition, fees, room and board, and the wages they would have earned if they had graduated and joined the workforce full time. Students often take fewer than 15 credit hours a semester because 12 credit hours is considered full time by a majority of colleges and universities and many financial aid programs. Not all students can complete 15 credit hours a semester for a variety of reasons. However, many full-time students would need to take just one more course each semester to graduate on time. By completing 15 or more credit hours a semester, students can graduate earlier, enter the workforce sooner and save thousands of dollars in education expenses. Graduating on time also can help reduce student loan debt by eliminating the need to borrow money for an additional year or more of college. Legislation signed into law in June 2016 established the 15 to Finish Act, which calls for the Missouri Department of Higher Education to develop policies to promote the on-time completion of degree programs. Social media graphics: To download, click on the .jpg of the file you want, right-click, select "save picture as" and choose a file location. 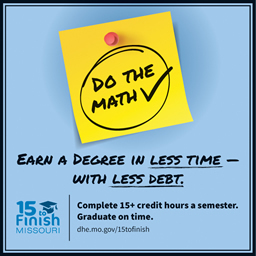 Missouri launched its statewide 15 to Finish initiative in October 2016 at Missouri State University in Springfield.